The assignment was to find a single page ad in any magazine, that feels campaignable, and create/design/layout the next ad if it was part of the campaign. 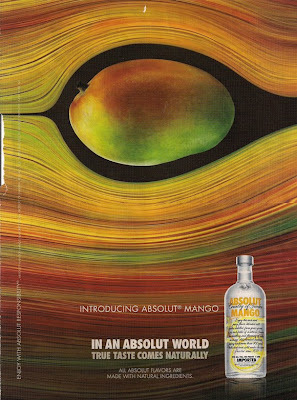 The top ad is the original Absolut print ad introducing mango to the collection of Absolut vodkas. Below it is a "triplet" ad I created that is intended to mirror the original in execution. I executed the triplet to the best of my abilities, and I think it turned out pretty well. I wanted to recreate the original by using the same underlying template, compositional structure and elements, including typography. 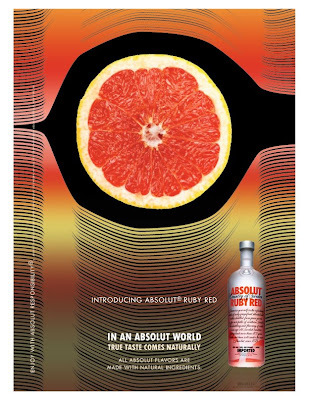 However, instead of using Absolut Mango, I chose to introduce Absolut Ruby Red, featuring a delicious grapefruit as the focal point. Through careful examination, I determined that the type used for the headline is Tw Cen MT Condensed Extra Bold, and Tw Cen MT was used for the rest of the copy. Here are two more triplets I created of the Absolut Vodka, In an Absolut World campaign. These particular ads are different from the first ad from above. Instead of introducing a new flavor, these ads portray a fantastic/ideal world, all because of Absolut, hence, In an Absolut World. The campaign has been around for a while now, and has been successful in many different countries. 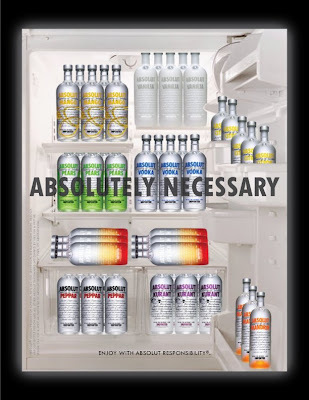 I wanted to exaggerate the necessity of having Absolut Vodka, by stocking an entire refrigerator with it. The first ad is an exact triplet with the same headline, "In an Absolut World," and the second one I thought up a new headline that I thought was equally effective, "Absolutely Necessary."